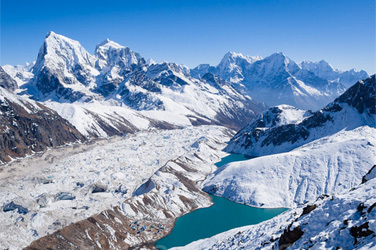 Jiri to Gokyo Lake Trek is a famous trek in the world. Nepal, the land of Mt. Everest is popular for friendly people, beautiful scenery, and a great variety of cultural traditions. Our journey from Gokyo in the Everest region will take into the world's most impressive mountain range that will create lasting memories and instill a sense of accomplishment. This blend of outdoor adventure and cultural exploration is a great way to experience the Himalayan mountains! Popularly known as the second most popular trekking destination in Nepal, Everest region is more expensive and difficult than the others. The region is popular not only due to its proximity to the world’s highest mountain (8848m) but also for its ever-smiling hardworking Sherpa people, unique settlements and age-old monasteries. Jiri is situated about 188 km. far from Kathmandu. It is the starting point of our trek to the Everest region. The people of Jiri are called the Jirels, a subgroup of the Sunuwars whose language is more or less similar to Sherpas. We follow an ancient route that will take us through tiny villages, across high mountain passes, and through remote valleys, villages, and monasteries. The views grow even more spectacular as we venture up the Dudh Kosi River to Namche Bazaar, the gateway to the Khumbu region situated at 3440m then continue trek to Gokyo and make a climb Gokyo Ri then return all the way Tengboche Monastery again continue trek to Namche Bazaar and trek end at Lukla then next day we catch morning flight to Kathmandu.